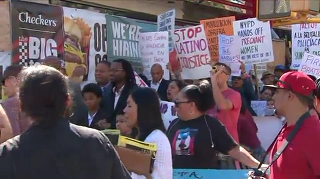 NEW YORK - Minorities took to the streets of the Sunset Park section of Brooklyn today to express their concern over two recent incidents involving alleged police brutality with Latinos. The first event involved the police kicking of a street festival vendor and the other was the police shoving a pregnant woman in the course of a nearby arrest. Both events were videoed by bystanders. The NYPD is reportedly investigating both matters.